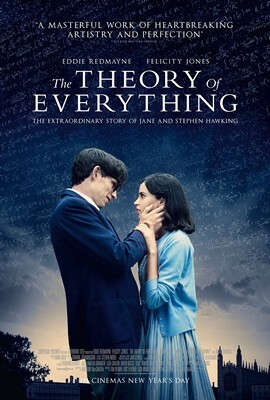 Last night I went to see The Theory of Everything, the biographical film about Stephen Hawking, adapted from the memoir of his ex-wife, Jane Wilde Hawking. News literally just in – it has been nominated for the Best Picture and Adapted Screenplay Oscars, and there are Best Actor and Best Actress nominations for Eddie Redmayne (Stephen) and Felicity Jones (Jane). Arguably today’s most famous scientist, Stephen Hawking is a theoretical physicist and cosmologist, now holding the position of Director of Research at Cambridge’s Centre for Theoretical Cosmology. He suffers from motor neurone disease; a degenerative disease that has left him unable to move most of the muscles in his body. He now communicates by selecting letters and words on a computer screen using one muscle in his cheek. His computerised voice is world famous and instantly recognisable. He is responsible for ground-breaking work on black holes and general relativity. I thought the film was fantastically made and the acting incredible; Redmayne’s portrayal of Hawking’s physical condition was uncanny. I shed a few tears at the plight of this man surviving against all the odds whilst doing incredible theoretical physics, and his wife, ever patient and loving, taking care of him and bearing his children despite his health getting only worse. There have been some complaints about the lack of focus in the film on Hawking’s scientific work; the film instead focuses mainly on his relationship with Jane and their struggle as his condition deteriorates. This should not be a surprise when the film was adapted from Jane’s own writing. If you want to know more about Hawking’s work in physics, then I strongly recommend his physics books. I first attempted to read A Brief History of Time, his most famous publication, age 11. This was obviously optimistic of me, and I gave up after the first couple of chapters. I tried again during my A-levels but never got round to finishing it, but having now studied cosmology and general relativity in much more detail I fully intend to give it another try! I have however read The Universe in a Nutshell, a more accessible book on the history of modern physics and cosmology, as well as discussions on that holy grail of physics, and the title of the film, a ‘theory of everything’. If we do discover a complete theory, it should in time be understandable in broad principle by everyone, not just a few scientists. Then we shall all, philosophers, scientists, and just ordinary people, be able to take part in the discussion of the question of why it is that we and the universe exist. If we find the answer to that, it would be the ultimate triumph of human reason — for then we would know the mind of God. Sounds good, right? The ultimate triumph. Unfortunately, so far, attempts at developing a ToE have not delivered. Why not? First we need to understand a little more about the physics we know and understand. Electromagnetism – the interaction of photons and charged particles that we are familiar with in electricity, magnets, etc. Weak force – the interaction responsible for radioactive decay. Why four? No one knows. It has been shown that at electromagnetism and the weak force can be combined into an ‘electroweak’ force at high energies. This means that in our everyday low energy universe (as opposed to the hot dense universe shortly after the big bang) that electromagnetism and the weak force are just two faces of the same force. If electromagnetism and the weak force can be combined, can we do the same with the strong force and gravity? Combining the electroweak and the strong force results in a “GUT” – a Grand Unified Theory, (NB despite being grand, this does not yet include gravity). The energy required to see the joining of the strong and the electroweak would be beyond the levels we could reach with particle colliders. We do not currently have a generally accepted GUT, but there are lots of complicated theories in the works. The final step to a ToE would be the joining of gravity with a GUT theory. This is the real sticking point. As Jane illustrates with a pea and a potato over dinner in the film, the unification of quantum field theory (the pea) on the tiny scales with general relativity (the potato) on large scales has so far proven undoable. Quantum field theory is what we particle physicists deal with, the standard model of particle physics, tiny things like photons and quarks and electrons, all interacting via electromagnetism, the weak force and the strong force. General relativity is far in the other direction; stars, galaxies, galaxy clusters. Big things with lots of mass, causing curvatures in space-time that manifests as gravity. Both quantum field theory and general relativity have been tested to extreme precision – they both work perfectly on their relative scales. So where does the problem in joining them lie? Hawking’s greatest work is on black holes; the infinitely small and dense aftermath of the collapse of an enormous star. 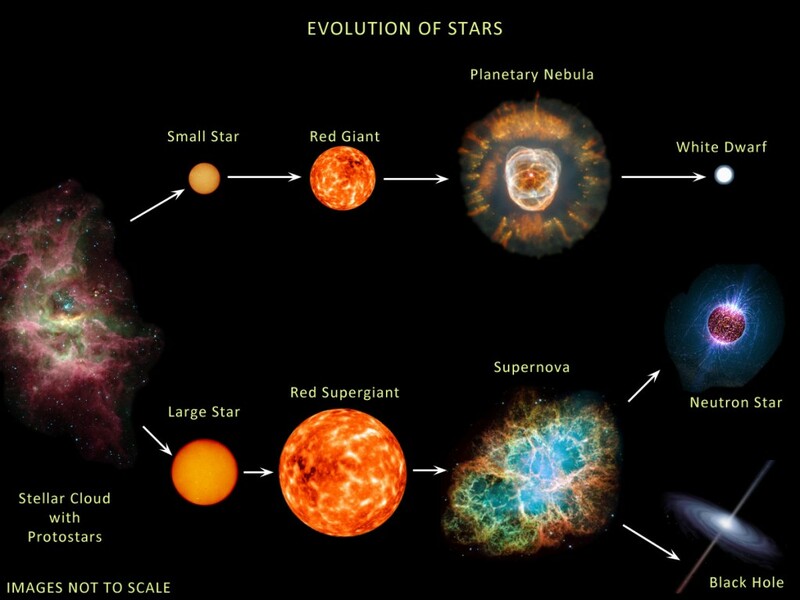 Once a star greater than about 23 solar masses runs out of fuel to produce energy, its core collapses under its own weight, expelling its outer layers in an explosion called a supernova that outshines its own galaxy. If the core is big enough, it will continue collapsing until it becomes a ‘space-time singularity’ – a point in space infinitely small and dense, where not even light can escape. When we try to understand the physics inside that point, we start encountering problems. We need both quantum field theory and general relativity – we have a tiny tiny space but a huge mass, and infinities start popping up all over the place. The maths just doesn’t work. Hawking has dedicated much of his life to trying to unify these two pillars of modern physics, so far with no luck. This begs the question, if his incredible mind cannot do it, what hope do we have? Currently, a popular approach is string theory – the theory that everything is made of tiny strings, vibrating in many (up to 26!) dimensions. This may sound silly, but it’s actually quite elegant – each different particle is made of a string vibrating in a different mode. An issue with string theory currently is it offers no easily testable predictions. Some of the best minds of today are working on this, so there is still hope! Stephen Hawking is clearly an incredible man. He has a level of intelligence and a talent in mathematics and physics most of us physicists can only dream of. However, I believe Jane also deserves a huge amount of credit. The diagnosis of motor neurone disease came only shortly after they began dating, but she embarked on a life with him, marrying him and having his children, taking on the mammoth task of caring for him mostly alone, despite his prognosis of only 2 years to live. 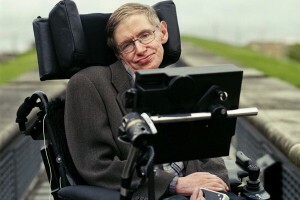 Of course, Hawking has far exceeded those two years. He is now 73, reaching what is basically a normal life expectancy despite having a disease that has an average survival from onset of only 3-4 years. He was diagnosed aged only 21. Diseases such as his are tragic, leaving a person’s mind totally intact but trapped inside a failing body. Many would just give up, but Hawking’s love for both Jane and physics drove him to persevere and become the esteemed professor he is today. I strongly recommend watching The Theory of Everything, even to those uninterested in cosmology. It’s a beautiful, romantic drama set in picturesque Cambridge, emotionally powerful and moving, and certainly does not require you to understand the physics!